Imagine you are dropped somewhere in history between 1920 and 1979 and you have to invest in the U.S. stock market for the next 40 years. You have 2 investment strategies to choose from. Dollar-cost averaging (DCA): You invest $100 (inflation-adjusted) every month for all 40 years. Buy the Dip: You save $100 (inflation-adjusted) each month and only buy when the market is in a dip. A “dip” is defined as anytime when the market is not at an all-time high. But, I am going to make this second strategy even better. Not only will you buy the dip, but I am going to make you omniscient (i.e. “God”) about when you buy. You will know exactly when the market is at the absolute bottom between any two all-time highs. This will ensure that when you do buy the dip, it is always at the lowest possible price. So, which strategy would you choose: DCA or Buy the Dip? Logically, it seems like Buy the Dip can’t lose. If you know when you are at a bottom, you can always buy at the cheapest price relative to the all-time highs in that period. 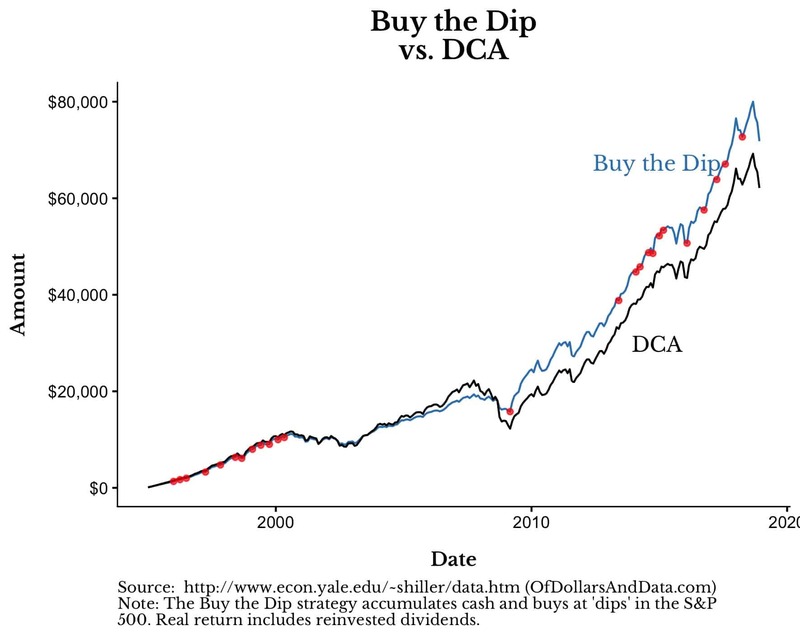 However, if you actually run this strategy you will see that Buy the Dip underperforms DCA over 70% of the time. This is true despite the fact that you know exactly when the market will hit a bottom. Even God couldn’t beat dollar-cost averaging. Why is this true? Because buying the dip only works when you know that a severe decline is coming and you can time it perfectly. Since dips, especially big ones, haven’t happened too often in U.S. market history (i.e. 1930s, 1970s, 2000s), this strategy rarely beats DCA. And the times where it does beat DCA require impeccable timing. Missing the bottom by just 2 months lowers the chance of outperforming DCA from 30% to 3%. Instead of taking my word for it, let’s dig into the details to see why this is true. Now, I am going to show the exact same plot as above, but I am going to add a red dot for every “dip” in the market (the biggest decline between a pair of all-time highs). 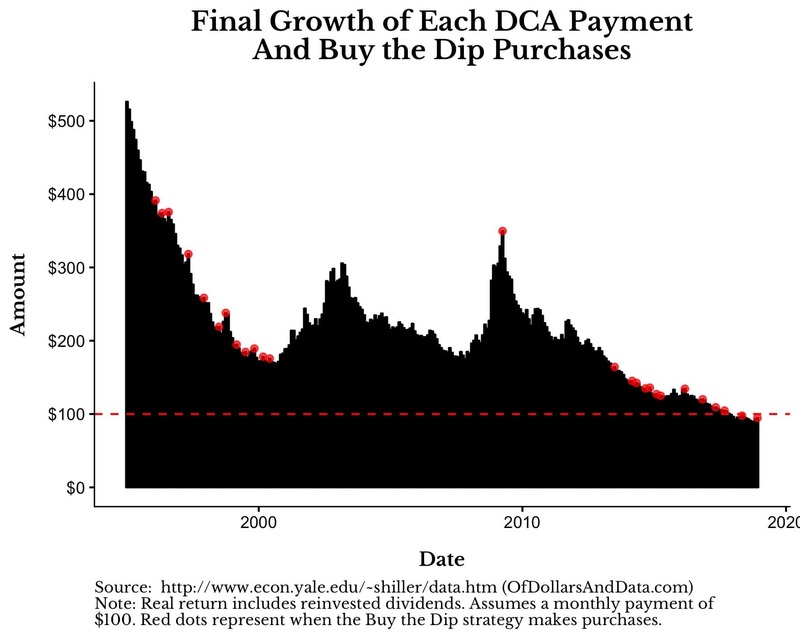 These dips are the points at which the “Buy the Dip” strategy would make purchases. As you can see, the dips (red dots) occur at the lowest point between any two all-time highs (green dots). The most prominent “dip” over this time period occurred in March 2009 (the lone red dot before 2010), which was the lowest point after the market high in August 2000. 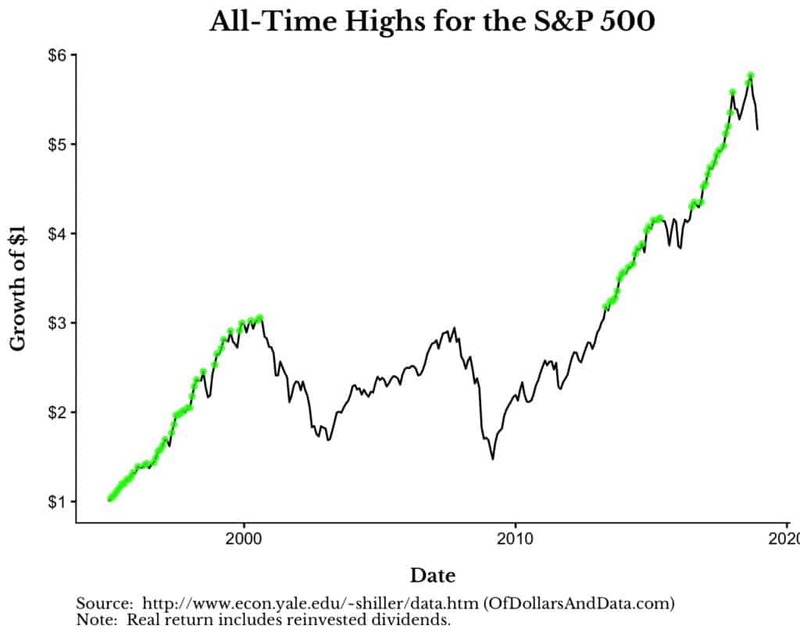 However, you will also notice that there are many less prominent dips that are nested between all time highs. These dips cluster during bull markets (i.e. mid-to-late 1990s, mid 2010s). There are a handful of big dips (i.e. February 2003, March 2009) where some payments grow to a lot more than others. Buy the Dip works incredibly well over this period because it buys the biggest dip ever (June 1932) early on. Every $100 you invested at the bottom in June 1932 would have grown to $4,000 in real terms! There is no other time period in U.S. market history that even comes close to this. I know it might sound like I am trying to sell the Buy the Dip strategy, but the 1995-2018 and the 1928-1957 periods just happen to be two where there were prolonged, severe bear markets. 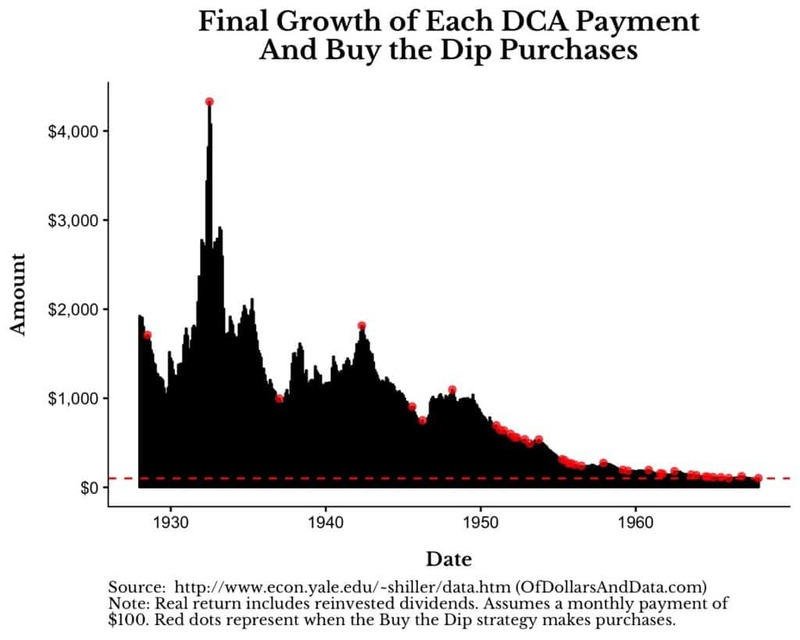 What you will notice is that Buy the Dip does well starting in the 1920s (due to the severe 1930s bear market) with an ending value up to 20% higher than DCA. However, it stops doing as well after the 1930s bear market and does continually worse. 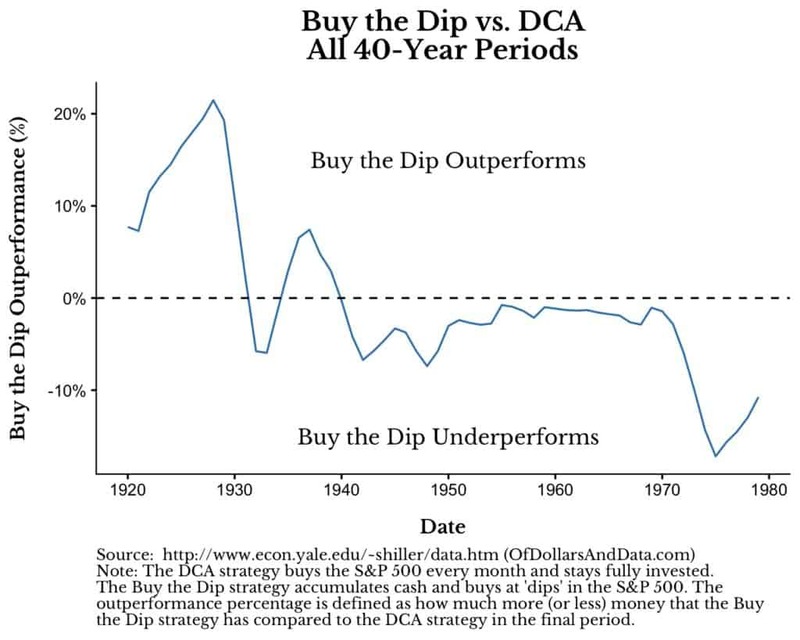 Its worst year of performance (relative to DCA) occurs immediately after the 1974 bear market (starting in 1975). As you can see, unlike the 1928-1957 or 1995-2018 plots, Buy the Dip does not get to buy large dips early. It does get to buy the March 2009 dip, but it happens so late in the simulation that it doesn’t provide enough benefit to outperform. 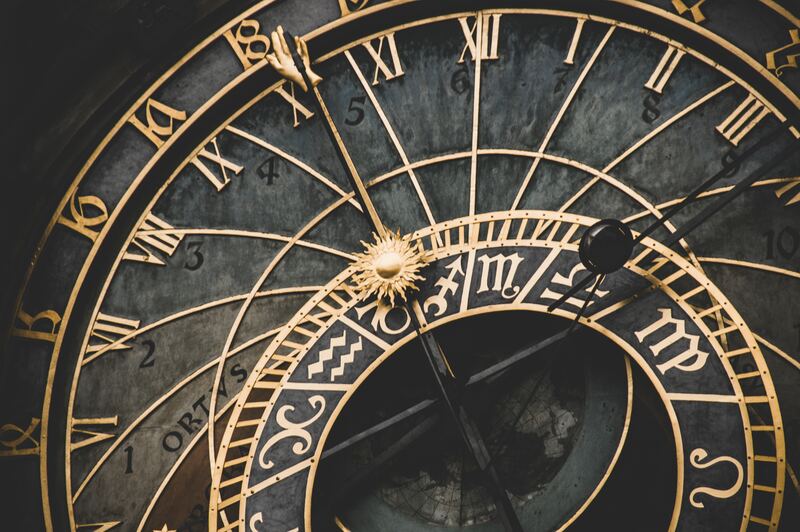 One of the most important things I re-learned from crunching all the numbers for this post is how dependent we are on timing luck (formally known as sequence of return risk). This is something that is completely out of our control. For example, the best 40-year period between 1920 and 1979 was from 1922-1961, where your $48,000 (40 years * 12 months * $100) in total purchases grew to over $500,000. Compare this to the worst period 1942-1981, where your $48,000 in total purchases only grew to $153,000. That is a difference of 226%, which is much larger than any divergences we saw between the DCA and Buy the Dip timing strategies! Your strategy is less important than what the market does. God still has the last laugh. If you made it this far, congratulations on finishing this monster post. I hope it makes you re-consider having “cash on the sidelines” ever again. Lastly, special thanks to this Alpha Architect article for inspiring the post title and thank you for reading. Now do Japan, or China – markets that haven’t gone up in perpetuity over decades. Personally, nothing ever has served me as well as diligently saving, investing and re-balancing once a year. I appreciate the comment and partially agree. I don’t think this idea is necessarily that intuitive. I didn’t know I would get this results when I started this. I was just interested in seeing what would happen. 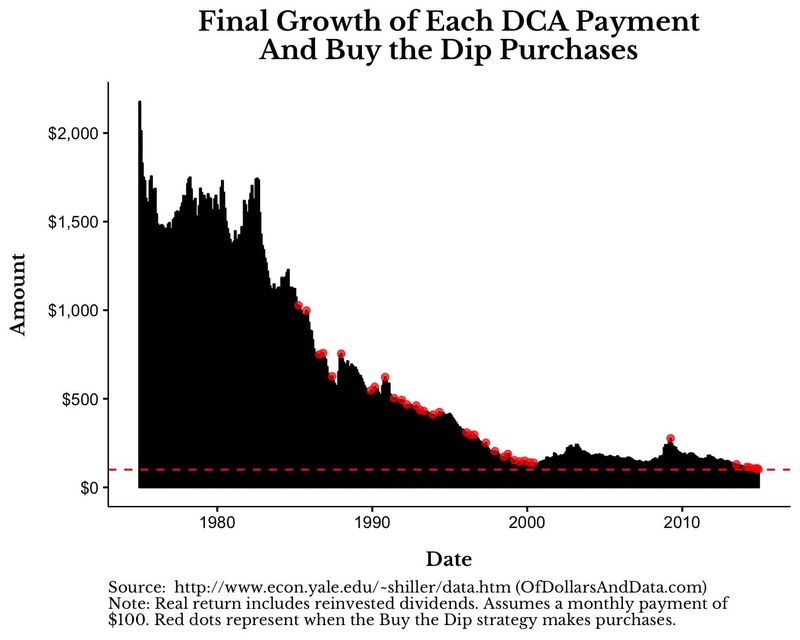 The thinking behind why DCA > Buy the Dip most of the time is what was most intriguing to me. What about a “lump sum”? Say you receive an inheritance, a large tax refund, or something else that is large and all at once. Obviously, putting the cash into a savings account and DCA every month over 40 years doesn’t work either. Great article for savers though! For a lump sum or windfall investor, sitting on a pile of cash, it sounds like combing the two strategies would work well. Commit to a DCA strategy while also setting up a rule where additional lump sums get invested as the market drops. Thanks for the post, Nick. One quick follow-up question- did you consider the yields on cash (via 6-month T-bills, historical CD rates, or any other metric) over the years? Clearly yields are very low today, but in the 80s 6-month CD rates were 7%+ for the majority of the decade and in the 90s were often above 4%, which would improve the BTD results (would have higher cash balances to purchase more stock on the dips.) I would assume many investors who build up cash to buy on dips would attempt to get some yield on their cash in the meantime. I assumed inflation-adjusted cash over time (i.e. invest in TIPS). I did not look at using other forms of fixed income, but my prior suggests that they would not change the results that much. And even if they did, remember that Buy the Dip still requires perfect timing, which is the most ridiculous assumption I made. By Buying the Dip a little later than the bottom and all the outperformance would likely fade once again. So, on balance, I don’t think the cash yield was that wild of a thing to ignore. I posted harsher comments on Marketwatch.com, but in fact, you did a really good work. I just want to hear from you about the comments that I made. Most people read stuffs online without any critical thinking, and I’d love to hear your feedback on my comments. Because all of the invesment dollars are never sold in your comparison, the “market timing” that you are trying to compare is in fact relatively minor. Or I shall say that you didn’t give “God” the chance to sell and time the market perfectly, because it is not allowed in your comparison. Therefore, you are really just comparing the market timing of the initial investment. 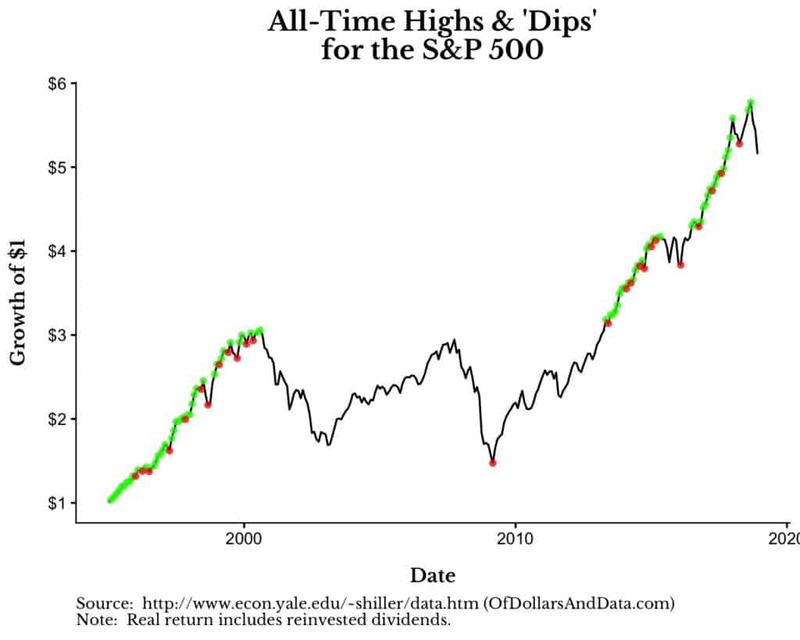 I don’t know the exact criterion for you to determine the “dip”, but what you have definitely shown here is that stocks tend to go up more than go down, and it doesn’t really pay to sit and wait around for the next correction dip. If you did add the selling, I believe the results will be very different. My personal belief is that market timing (for either buy/sell) doesn’t work possibly 95% of the time, but towards the end of the bubble peak, it would become obvious. If one just catches that 5%, maybe the results would be different. But obviously, that’s just my conjecture. I am trying to compare a market timing strategy that actual investors do. 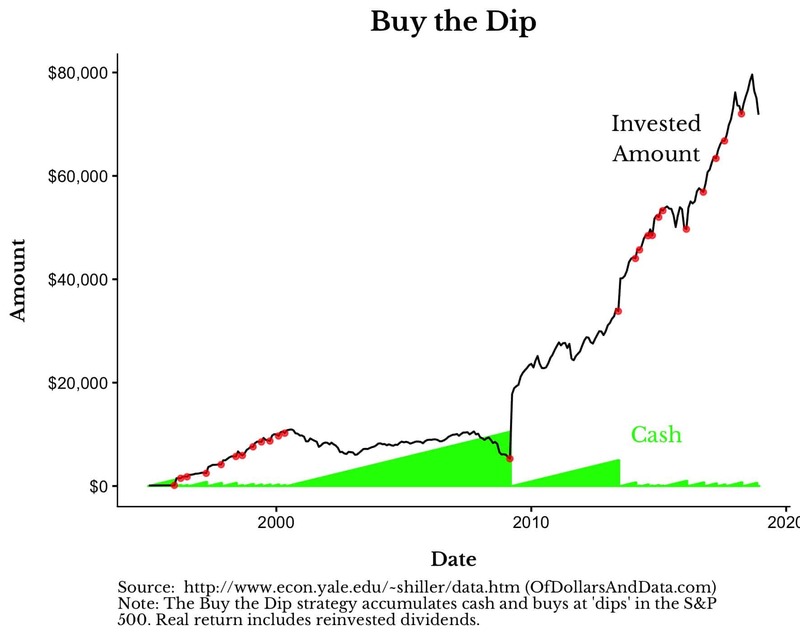 Frequently people build up cash to buy dips and don’t necessarily move completely out of stocks. This is far more common than selling out completely and buying back in completely (which would change the results dramatically as you suggest). My point in this article is to suggest that building cash on the sidelines (while a good portion of your assets are invested) is usually suboptimal to a DCA strategy, especially if you can’t time which no one can consistently. As for the “it would become obvious” near a bubble peak. This is wishful thinking. It was obviously a DotCom bubble in 96 and 97, but it didn’t burst for 3 years. That is 3 years of you shorting or sitting on the sidelines while watching your friends get rich. Good luck timing that. Few did successfully. Nice post. Thanks a lot! Thanks for your thoughtful analysis. I’m always jealous of people like you that have the programming skills to back-test interesting ideas. Have you considered that the results are largely driven by how you’ve chosen to frame the question (i.e. 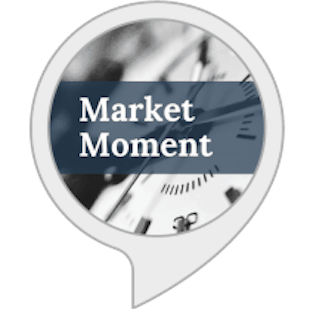 you’ve defined market timing as buying the dip)? No market timer or asset allocator I know would ever do this. They would either use trend (just like the Ritholtz’ “Goaltender”) or valuation (which isn’t necessarily the same as buying a dip). Also, how does the analysis look if you risk-adjust the return? 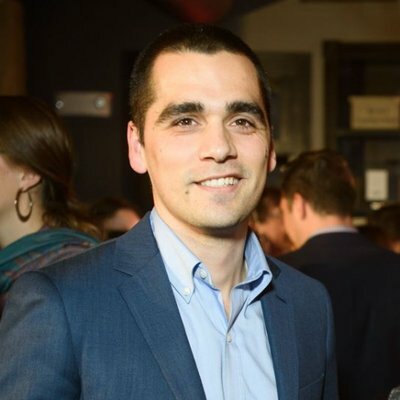 You could compare the two strategies in terms of Sharpe ratio. I agree that this article does not answer every market timing question. My quip about being the “last article you will ever need to read on market timing” was more for theatrics. However, I don’t think how I have framed it is controversial. I know many individuals that build cash piles in hopes of buying a dip. This is the exact behavior I am trying to get people to stop undertaking. 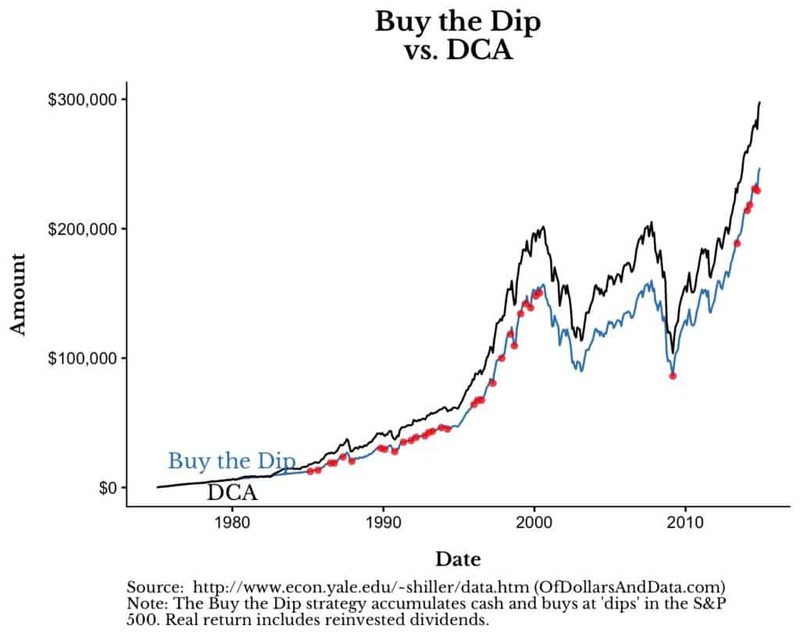 Lastly, of course Buy the Dip would have a better Sharpe ratio than DCA (cash is less volatile than the market), but this misses the point. The only reason that it is less volatile is that I have given you PERFECT information. You KNOW when the dips will occur so you can avoid market volatility while you wait. This is so unfair and unrealistic that comparing Sharpe ratios is all but meaningless in this scenario. How about digging into the retirement version of the same question. Assume the retiree needs $3000/mth on a $1,000,000 60/40 portfolio. Would it be better to “sell the dips,” sell every month, or just sell once a year? Can you open source your code for this? I’m curious to see what would happen if you set a rule to invest all your cash at the end of each month if there was no dip by then. I too am curious about how this works for retirees that are exiting their 60/40 portfolio for cash flows in retirement. Assuming a 4.5% withdrawal rate including dividends and income being withdrawn/distributed. How would selling at the highs extend the life of the portfolio when liquidating on a quarterly basis versus systematically “dollar-cost-averaging” out of their positions also quarterly. Applying the video-game “God” mode, perfectly timing the high of the each quarter when they liquidate-how much further their portfolio would sustain their income. Hi nice post. Why didn’t buy in the dip of around 2001/02? Great post! Really thought provoking. Here’s my question for you and the community. Do you think its best to max your 401k as quickly as possible or spread that 19k contribution across the 12 months of the year? I’ve argued for and against this and have done both. Would be interested in everyone’s thoughts. I am writing a post on this now (Lump Sum vs. DCA). Lump Sum is almost always better than DCA and the performance differences won’t be that large over shorter time periods. Also, given you have the ability to max earlier in the year without any affect on your need for cash is good. Don’t know if everyone could do this. Yes, what you call buying the dip is not a good strategy. However it makes sense to do a little timing when your whole position looks to be in jeopardy. I sold all October 2018 and got back in January 2019. Saved me 10% loss. Moving on. Nice post with more analysis than most. I may try to look at it myself if I ever get time free from kids etc but rather than building up cash and “perfectly timing major bottoms” which can take many years to play out e.g. the big gap from 2000 to 2009 I would look at a scenario of build up cash and buy x% below peak. Much easier to implement since you don’t need to verify God. If x is 10 then you will not have to wait as long to buy. Be interesting to optimise for x. It all relies on the market going up over time and not sitting on the sidelines too long. Wonderful analysis & post. Although, embarrassed that I have mixed DCA and lump summing in during my accumulation phase — obviously, my nest egg is smaller because I have been well-short of God-like. Thank you Nick, I have shared this with my adult children in hopes they don’t walk in my lump sum footsteps. What interst rate was assumed for the cash that sat waiting for the next dip in the buy-the-dip case? Interesting article.. Have you thought about tweaking “Buy the dip” definition from “buying at the lowest price”, which no investor could reproduce in the real world, into “buying in the lowest decile of price range within the 3, 6, or 12 last months”? I have put these different timeframes because I suspect one of them may have a chance to beat DCA. Thanks to the short term volatility of equities, buying in the lowest decile for a 3 month-range happens frequently enough to be still in the market, while it ensures that we do not buy at top prices. During a market downturn, the average cost would be further lowered when a buy in the lowest decile in a 6 month / 12 months range is triggered. One may consider this as timing the market, but if this can be set into an investment policy statement to follow such set of criteria happening frequently enough, it is really a DCA hybrid with buys triggered by both time and price. It is not trying to ‘guess the dip’, it is already buying the lowest point up until that time frame, regardless of the future performance. Your insights would be very much appreciated. I’ve been investing for 35 years so I have perspective on market downturns. I agree with you advice in this post but I think there is another way to approach this. Buy after a broad market crash stocks that you’ve wanted to own but thought they were too pricey. December 2018 created a great sale on stocks. 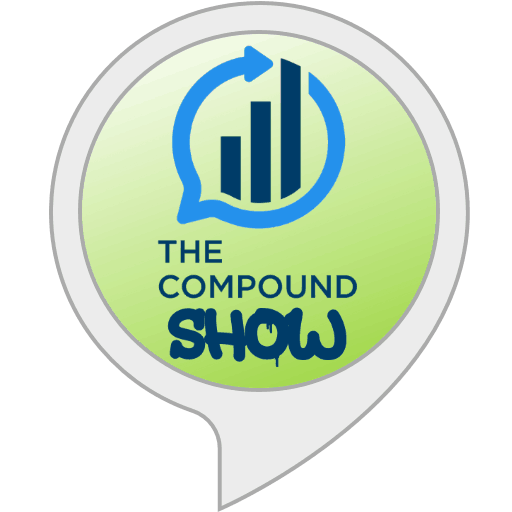 I purchased 15 investments that have already returned 39% annualized through 3/15/2019. The crashes are great for patient investors. This assumes it is commission free like a mutual fund. If you are paying a commission, frequent purchases may result in commission fees which significantly reduce your returns. My contention is that you shouldn’t put yourself on a schedule (i.e. invest $100 on the 1st of every month). Don’t wait to “have all your money already.” Don’t wait for some arbitrary date to invest an arbitrary amount. Instead you should invest every dollar as soon as possible. If it illustrates it better, try breaking it down into $25 increments. Does $25 invested on the 1st, 8th, 15th & 22nd of each month beat $100 invested on the 1st of the month over a 40 year period?